# EPK-16000 UNIVERSAL CHARGER & JUMP STARTER KIT ! Battery size 7" x 4" x 2". Weighs only 1 lb ! Arrives PRE-CHARGED & READY TO USE ! Click on picture for more details ! PowerBank 2600 : 5VDC 2600mAh Li-ION Backup Battery/Charger - for all your portable digital devices that charge up with 5VDC. Provides immediate power from USB 2.0 port on top. Re-charges with supplied micro USB cable-to-USB 2.0. 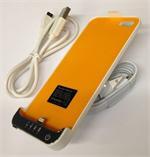 PowerBank2200 : Battery Charger for iPhone5, iPad mini. Arrives READY TO USE. Plugs right into iPhone and begins charging immediately. Typically provides 1 full charge into Phone. Includes micro USB re-charging cable. 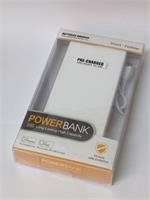 PB-8000: Li-ION Power Bank, 8000mAh, USB output. Slim & compact - size 6" x 3" x 0.44". USB output 5VDC @ 2A. Re-charges via micro USB input (USB-micro USB charging cable included). 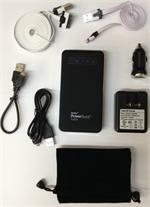 PB-10000 : Solar Power Bank, 10,000mAh Li-Polymer battery inside. Charges virtually any portable device or battery via dual 5V USB2.0 outputs. 1A and 2A USB charge ports. New door cover doubles the solar panel charger array. Includes micro USB recharge cable. 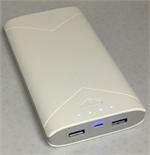 20,000mAh Li-ION Power Bank - with 2A and 1A USB outputs (5VDC). Charges phones & tablets simultaneously. 6" x 3" x 1", weighs 1.3 lbs. Includes USB-to-micro USB charging cord. Solar Charger & PowerBank 12000: ULTIMATE 10W Solar Charger and 12,000mAh Power Bank package ! Solar Charger & PowerBank 12000: ULTIMATE 10W Solar Charger and 12,000mAh Power Bank package! 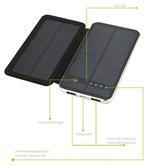 Includes 10W Solar charger with USB2.0 output, and 12,000mAh Li-ION Power Bank with 3 outputs. Charge up to 4 devices at the same time ! Charges up to 2 devices at a time ! Solar Rechargeable Power Bank, with 10,000mAh Li-ION Polymer battery inside. (1A and 2A charge rates). Can charge 2 devices at the same time! NEW FEATURE: now has extra fold-out solar panel, to double the solar array. Power Bank re-charges via Solar Panel (400mA/hr max), and also via micro USB jack. Has easy-to-read LED power status indicators. Size approx 6" x 4" x 0.8"
Weighs less than 1 lb. Includes USB-to-micro USB recharging cable. Portable, rechargeable, essential for phone power when you need it. or any portable device that can charge from a 5.0VDC USB type output. such as on a computer, or a portable wall charger, or 12VDC charger. Size: 4" long, 1" square. Outputs 5VDC @ up to 1A charge rate. 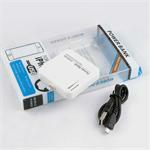 Provides quick, easy charging of cellphones and other portable digital devices. Has USB 2.0 output on top - charges your device via USB2.0 port. input with the supplied charging cable. Comes in retail gift box. Includes POWERbank, charging cord, lanyard & keyring.